Q: What is GVR’s Refund Policy? A: Due to the necessity of the tour company to arrange ahead of time and pre-pay for bus accommodations, admission tickets, and meals, no refunds will be issued after the date stated on the reservation confirmation. A: Full refunds will be issued if registration is cancelled by the member five (5) business days prior to the class start date. Online convenience fees will not be refunded in the event the student withdraws from a class. Those wishing to withdraw four (4) or less business days prior to the class start date (not including the day the class meets) will receive a refund, less the $5 withdrawal fee for each class. Refunds will not be offered the day the class starts. If you paid by cash or check, you will receive a refund check in the mail. If you paid with Visa or MasterCard, you will receive a credit on your card. Please allow up to fifteen (15) business days for your refund to be processed. Q: What is the Drop-in Policy? Please check the course description to confirm the class allows drop-ins. Check with a CSR to confirm the class is active (not cancelled). Drop-in availability is determined by class enrollment: drop-ins are not accepted in a full class. Please check the course description or with a CSR for any dates that the class will not be held or dates the class may be moved to another facility. Payment will be made to instructor at the beginning of class by cash or check made payable to GVR. Check the course description for the drop-in fee. To ensure a seat in class, registration is recommended. Q: How do I sign up for a class? A: You have four options when it comes to registering for a class. We recommend registering early, especially in the busy seasons as classes fill up quickly. 2. Walk-in registration – our CSRs will be happy to assist you with class registration. We have CSRs located at Canoa Hills, East Center, Las Campanas, West Center, and Santa Rita Springs (December through April). 3. Phone-in registration – CSRs are also available to assist you with registrations over the phone: (520) 625.3440. Phone registrations begin one business day after walk-in registrations. 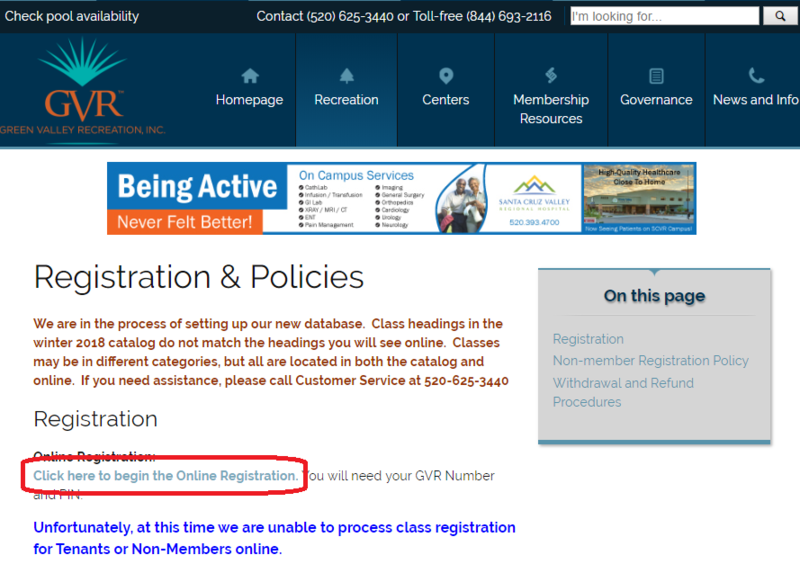 Q: Do I have to be a GVR member to sign up for a class? A: No, most of our classes are open to the public. There is an additional $10 fee per class for non-GVR members. Registration opens two weeks prior to the start date of the course. (Note: Ceramics, Clay Studio, and Lapidary classes are reserved exclusively for GVR members.) You may receive “Class Pass” upon registration and must acknowledge in writing that you will abide by GVR policies while attending courses at our centers. Non-members may attend a course that allows drop-ins if there is space available. Q: What happens if I can’t make it to a class? If a participant withdraws from a class more than five (5) business days prior to the start date, the class fee will be returned to the participant in the manner in which it was paid. Those wishing to withdraw four (4) or less business days prior to the class start date (not including the day the class meets) will receive a refund, less the $5 withdrawal fee for each class. No refunds are available beginning the day of the first class. Fees will not be pro-rated for missed classes. Full refunds will only be issued for classes cancelled by the instructor or GVR. Additionally, classes will be cancelled if minimum registration requirements are not met. Online convenience fees are only refunded for instructor or GVR cancellations. Q: How does GVR choose the fees for classes/tours? A: All of GVR’s instructors are contractors. Instructors are responsible for creating the curriculum and setting the class fees as well as any material fees assessed. GVR partners with Pleasurebent Tours and Gray Line Tours to offer travel opportunities for our members and their guests. We have a long-term relationship with Pleasurebent Tours, who hosts all of our domestic trips and tours. As of 2017, we began partnering with Gray Line Tours to host international trips to Rocky Point, Mexico. These partners choose a fee that will cover all of the activities involved in the trips. We are happy to have these two companies as part of the GVR family! A: We always encourage people to put their name on the waitlist. There is no cost and sometimes people get sick, go on vacation, or overbook their schedules and need to drop out. Waitlists also allow staff to see when there are more people interested in a class or event; sometimes we are able to add a session or increase the capacity. 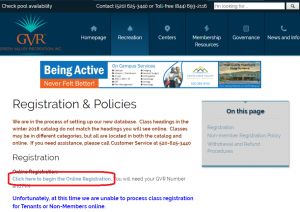 Q: How do I register for an activity online? A: Our software provider offers an online registration tool that is accessible from our website. 1. Go to http://www.gvrec.org and hover your mouse over Recreation. Click Registration & Policies to continue. 2. To start your registration click the Click here to begin the Online Registration link. 3. 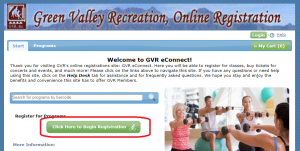 In the top right corner of the page you may click the Login button to enter your GVR Number (which is on your GVR member card) and Account PIN (you can call GVR to obtain or change your PIN). 5. Now you can begin looking up classes! 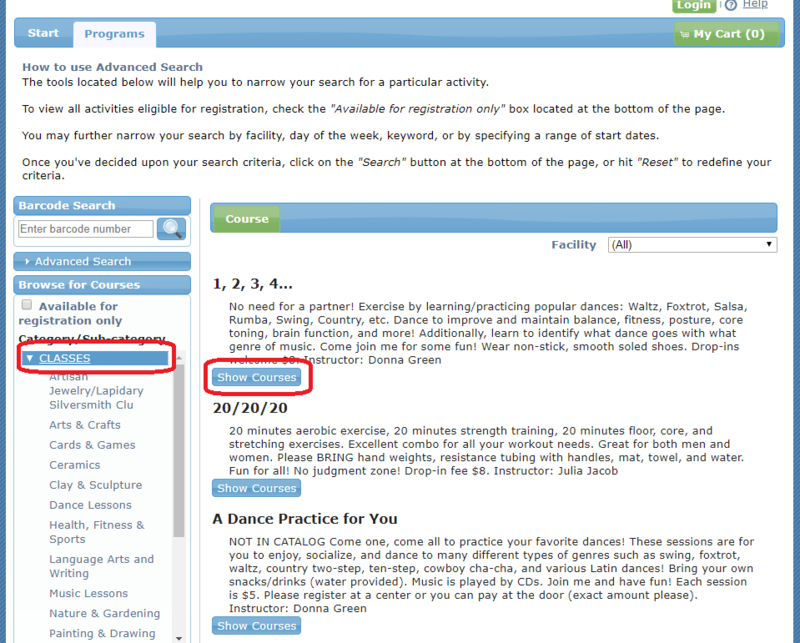 You can search by the barcode, which is the CR# of the class you want to take or expand Classes and you can browse all available classes. A: If all of the seats are filled, the Register Now button will be grayed out and not available to click. If you would like to be added to the waitlist, please call or stop by one of our centers and a CSR will be happy to add you. Q: What if I forget my login or password to register online? A: Your login is your GVR number and your password is a system generated PIN. You can elect to change your PIN to something you can remember, please see a CSR to change it for you. If you can’t recall your PIN, it is locked out, or you have never received your PIN, please see a CSR and they will be happy to look it up or unlock it for you. Q: Why aren’t all classes available for online registration? A: Classes whose instructors offer a multi-class discount are not available for online registration, please see staff to register for these classes. If you are unable to locate a class, please feel free to ask a CSR and they will be happy to look it up for you. A: Yes! 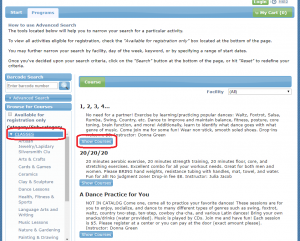 You can view all classes and activities online without registering. If you find an activity you wish to register for, you can simply login to complete your transaction. Q: How can I contact the instructor prior to/during/after my class? A: We do not post instructor contact information, but most instructors welcome the opportunity to speak with you. Please call our main number (625.3440) or see a CSR and they will be happy to provide you with the instructor’s phone number or email address. Q: What is a material fee? A: Instructors may assess an additional fee for materials or supplies required for the class. These fees could cover glass, handouts, paint, etc. Material fees are paid directly to the instructor at the first class via check or cash. Q: Where do the tour busses depart from? A: All tours depart from the Desert Hills center at 2908 S. Camino del Sol in Green Valley. Please park at the far end of the upper parking lot to allow space for those who are visiting or attending events at the center. Please arrive early for check-in and loading. Plan to arrive thirty (30) minutes prior in the fall and winter and fifteen (15) minutes prior in the summer time. There are restrooms in the center if you should need to visit them prior to departure. Q: When do centers receive the course catalogs? A: GVR distributes three (3) catalogs each year. Winter catalogs usually arrive in centers the last week of November and registration begins the first Monday in December. Summer catalogs arrive in centers around the first week in April and registration begins the first Monday in April. Fall catalogs generally arrive the last week of August and registration begins the second Monday in September. Q: How do I teach for GVR? A: GVR is always looking for new content and instructors! All instructors are contractors, which allows us to bring members a diverse catalog. The initial application process is 1) submit a resume specific to your education for the course you propose to teach 2) submit a course proposal. We will review and assess the needs for the proposed course, the education or training you are bringing to the course, and then decide to accept, postpone approval (re: seasonal factors), or deny the proposal. Q: Can I suggest a class to be offered at GVR? A: Of course! We try our best to ensure we are fulfilling your needs. We will assess the need for the course and if it is a desired offering we will attempt to locate an instructor to carry out the instruction. Q: Do you have an electronic newsletter? If you are looking for up-to-date news and updates about classes, you can click Classes under the Recreation tab on our website or click here: http://www.gvrec.org/activities/gvr-discover/classes/. Here you can find recently added classes or changes to existing classes.